For the old-school FPS fans who have played it, Blood is one of the most entertaining shooters ever made. 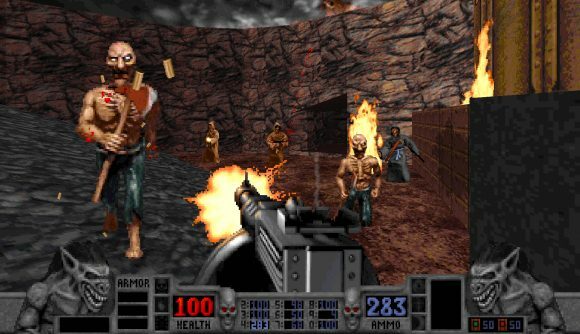 The only problem is that it’s tough to play now using anything but DOSBox – and even that’s got many issues – which is why Night Dive Studios’ announcement of a Blood Remastered edition a few months ago was such a welcome one. Now it’s looking likely that the remaster will be released as soon as next month. Blood Remastered was revealed in December, but things have been very quiet since then. Now a tweet from developer Samuel ‘Kaiser’ Villarreal claims that the game will at last be released in April, “as in this year” he confirms. The tweet was deleted, but was caught because it was posted on the internet. Villarreal is the developer behind the ‘Kex’ remaster projects, which include Doom64EX, PowerslaveEX, and others – which are designed to imitate the look and feel of these classic shooters as closely as possible, except with a range of enhancements and support for modern systems. His work has been tapped by Night Dive before, for their Turok re-releases, and now he’s currently working on BloodEX for Blood Remastered. He tweeted out about the release date for Blood Remastered in a reply to Polygon’s article yesterday about some new screenshots for the remaster, along with the comment “now stop asking me about it,” but immediately deleted it. Twitter user Wario64 caught the tweet and reposted a picture of it. April certainly sounds like a reasonable time to release Blood Remastered, despite being so soon, as producer Daniel Grayshon said when it was announced, “it really only needs minor updates to provide a better user experience for contemporary audiences.” It’s possible that Villarreal deleted his tweet because the release date has not been confirmed yet, but April does sound likely. Blood was originally released in 1997, and was the first game from Monolith – the developer behind F.E.A.R., Condemned, No One Lives Forever, and more recently the Middle-Earth: Shadow of Mordor games. It’s essentially a horror B-movie come to life, with zombies, tommy gun-toting monks, killer hands, and the ability to kick heads around like footballs. It was based on the Build engine, which will soon make a comeback in 3D Realms’ retro FPS Ion Maiden. Hopefully if Blood Remastered sells well it may bring us one step closer to Blood 3, or at least the remaster of Star Wars Dark Forces that we’re all rooting for.